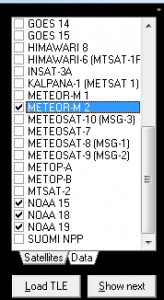 This is a faster method for decoding the Meteor satellites than the old way I’ve been using previously. 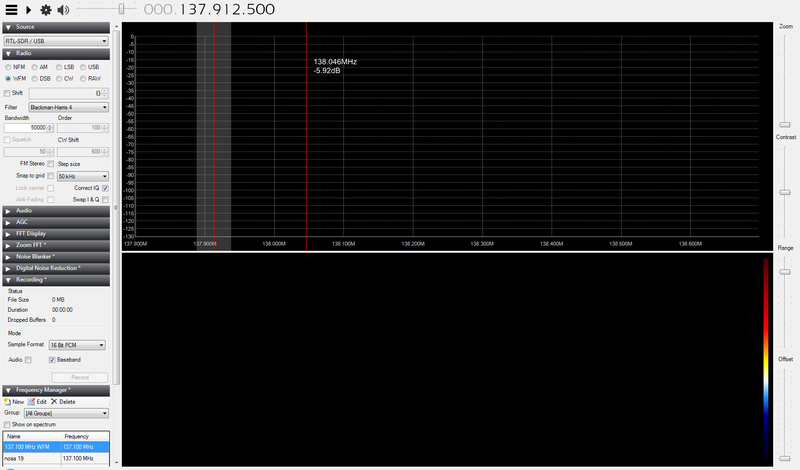 Ensure you have SDR sharp installed and setup on Windows 7 or later. 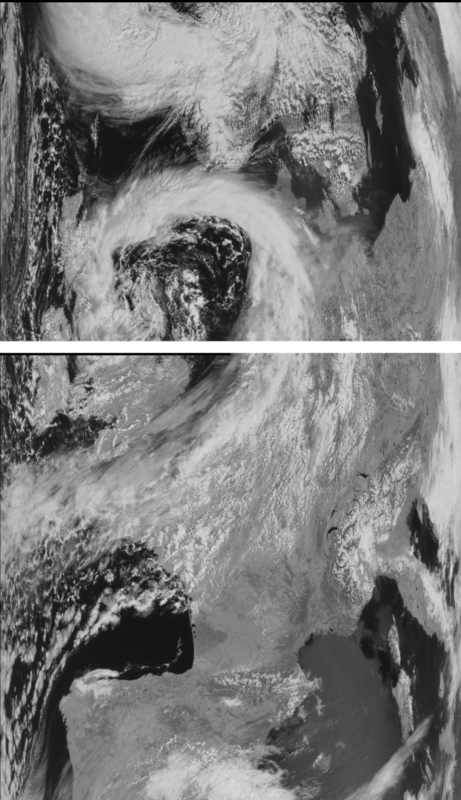 http://rtl-sdr.ru/uploads/download/meteor.zip which is from here: http://rtl-sdr.ru/page/komplekt-plaginov-dlja-priema-ka-meteor-i-drugih (might want to google translate the page – click the a-z in your address bar if using chrome). 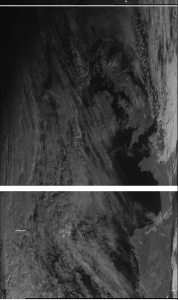 Now when you open SDR# you will see a new panel on the left – you can now click demodulate and then write to start recording your meteor satellite file. This method is a lot faster than the slower way previously posted. I’d be interested in seeing other people’s images if anyone would like to share theirs? There is a plugin for SDR sharp that now does a lot of this process for you and is all together a lot quicker. The SDR plugin way of doing it is less robust as I’ve compared both methods multiple times but the time savings are probably worth it. Here is an article to get you started. Above is a cropped image from the Meteor-M N2 polar orbiting Russian weather satellite that was launched on 8th July 2014. 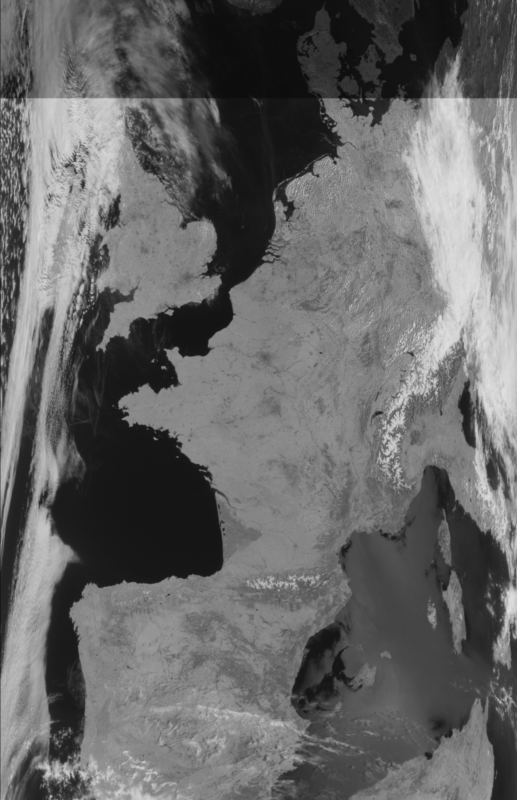 From this satellite we can freely acquire Low Resolution Picture Transmission (LRPT) images. 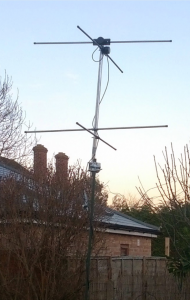 The signal is not very strong if you just use the dongle and the aerial. An amplifier is necessary between the antenna and the SDR dongle. For best results you will need a low noise pre amplifier followed by a higher gain amplifier. All in you will need approximately 40-50db gain. Setup your hardware. Put the aerial in a suitable location, outside away from metal structures is probably best. 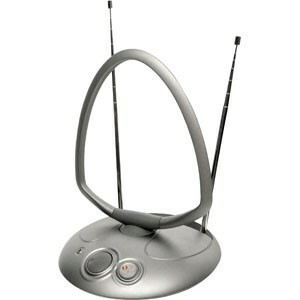 If not using a TV aerial with built-in amplifier then connect up the aerial to the first low noise pre-amp and then connect the output of the pre-amp to the input of your higher gain amplifier. Attach your SDR USB dongle to the output of your amplifier and plug it into the a USB slot. Everything is now wired up and ready for you to install and setup all the software. 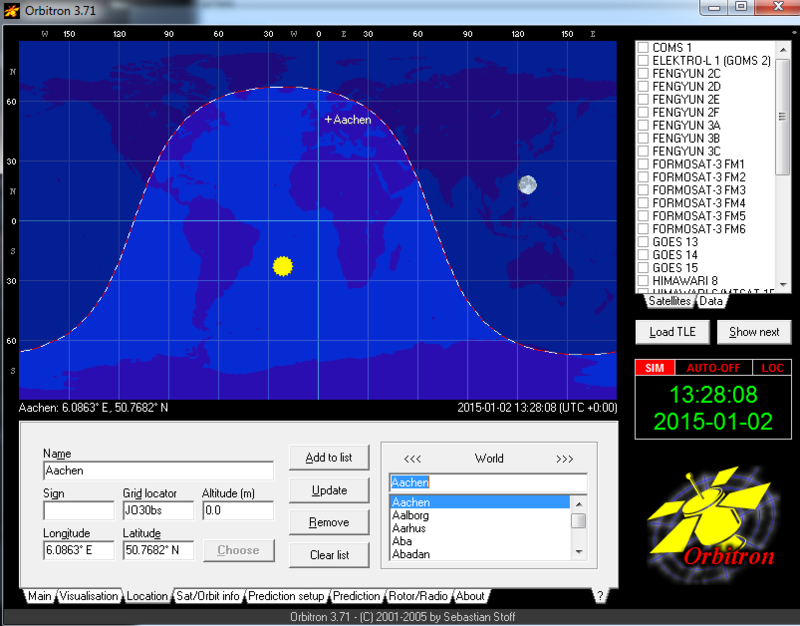 Orbitron is the software which will allow us to track the satellites and know then they are close enough for us to hear them with our receiver. Install Orbitron by downloading it and running the file. 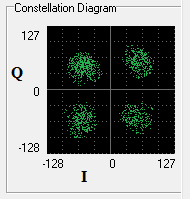 We now need to setup Orbirton to get the correct Kepler elements needed to track the satellites. Setup Orbitron by following these steps. 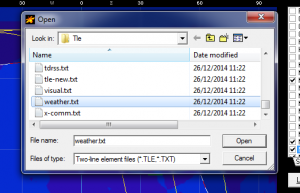 Click it and choose AutoUpdate TLE, click ok and let it update all the .txt files containing the orbital elements. Download it and follow the installer. Download SDR sharp and run the batch file in a CMD running as admin. This will download the files needed for SDR Sharp to run. 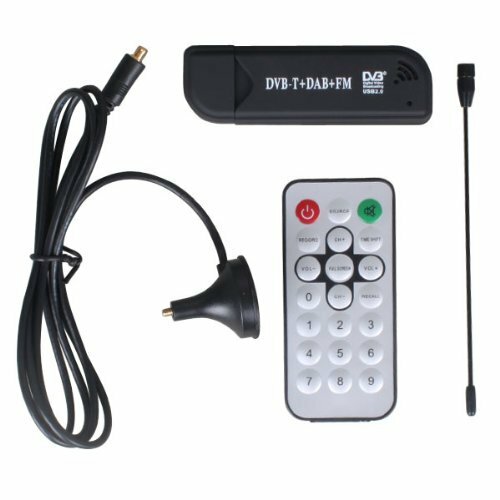 Ensure the SDR dongle is plugged in and follow below to setup the SDR USB driver. You must first run \sdr-install\sdrsharp\zadig.exe, again this must run as admin. 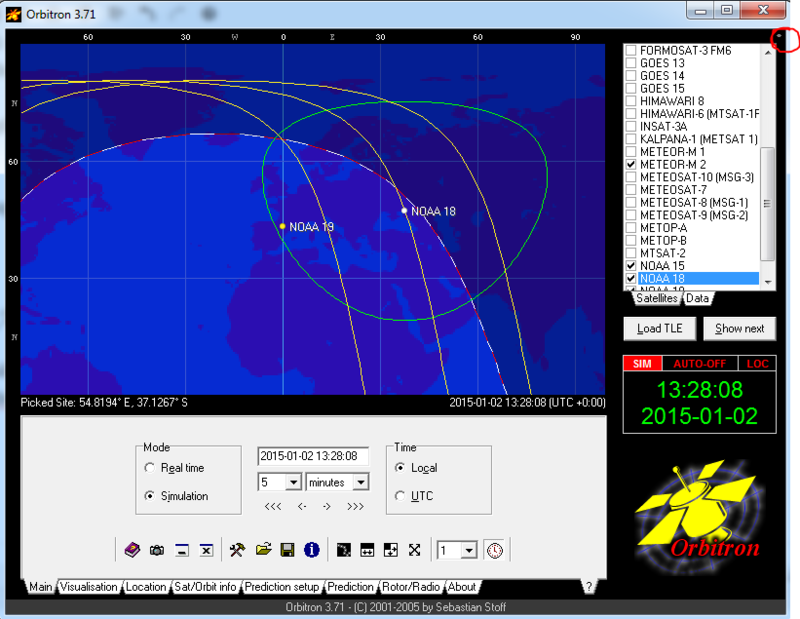 Now, start up SDRSharp.exe and select RTL-SDR / USB in the source drop down. We also want to make sure other settings are correct. Recording LRPT signals requires that we select Baseband in the recording tab, not just the audio like we do with NOAA satellites. The last part of the SDR setup is to set our frequency. 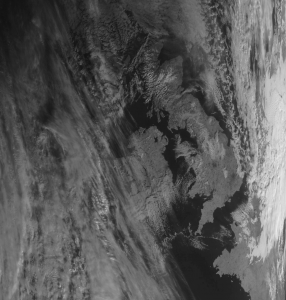 The Meteor M2 satellite is transmitting on two frequencies, we will be listening to the signal on 137.1MHz. 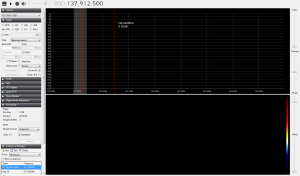 So set your SDR sharp frequency to that. Note: you may also need to increase your gain in SDR Sharp under the cog menu icon, mine is set to ~30db but this is something that will differ for every setup and should be tweaked to what looks good for you, i.e. increase the gain until the signal noise is increasing at the same rate. So things start to get a little more interesting now. 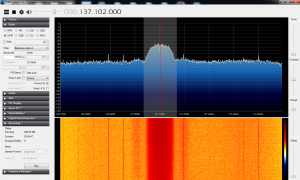 Once you click the run arrow icon you should start to see a spectrum of signals and noise in SDR Sharp. Make sure the satellite is going over / close to your location. Step 8 – Decoding and preparing the files. Find the file that was saved, usually saved in the same directory as the SDRSharp.exe you ran. Open the .wav in audacity. Amplify (effects->amplify) the signal only if needed. The amplitude during the main signal should be approximately 2/3 of the maximum. 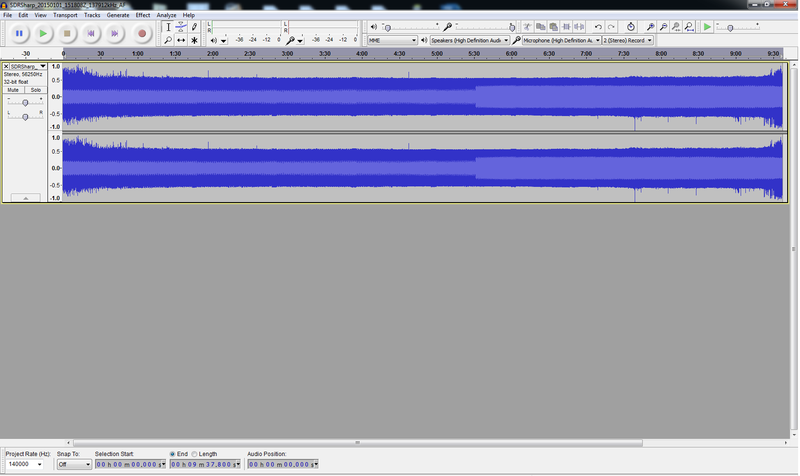 Then export the audio (File > Export audio) and save it somewhere. 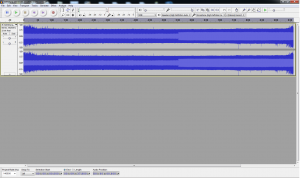 Open the file you exported from audacity with the LrptRx.exe application. Let LrptRx.exe run until the progress bar in the middle gets to the end but beware it will not stop automatically so manually stop it near or at the end, no idea why the author did not make it auto stop, sigh. Now find the output file generated by LrptRx.exe and start up LRPToffLineDecoder.exe as admin. Tick the ignore RS check box. Click the 72k button and open your .raw file, your image should slowly start to appear. Then click generate and save the image, below is my first ever M2 image, a bit broken up but not bad! Please do feel free to share yours here too, i’d like to see them. 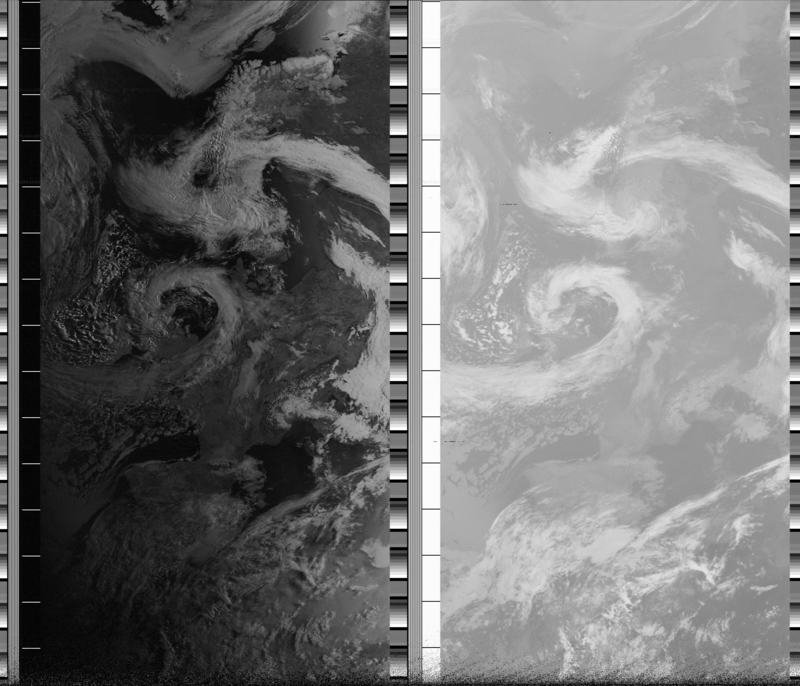 Phew, that’s a lot of work but it’s worth it for the unique images we can get. I will be investigating other ways to process the files as this method is very time consuming and requires many manual steps. Once I have an automated way of doing this with either the same or different software I will definitely post my method.